KAITLIN M. AKERS, Esq. - Nathan, Dumm & Mayer P.C. Before attending law school, Kaitlin earned a Bachelor of Science degree in Environmental Science from the University of Denver. Kaitlin received her law degree from the University of Denver, Sturm College of Law and was admitted to the Colorado Bar in October of 2014. While in law school, she participated as a mediator in the school’s Mediation Clinic and as a Student Attorney in the Civil Litigation Clinic. She also served as Vice President and Treasurer of the Native American Law Students Alliance, and worked as an Academic Achievement Program Leader mentoring first-year law students in Torts. Kaitlin was a recipient of the Sturm College of Law’s Robert B. Yegge merit-based scholarship. Prior to joining this firm, Kaitlin worked as a Resident Attorney for Wheeler Trigg O’Donnell, LLP, assisting with the defense of a variety of civil suits. 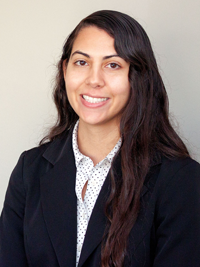 Her current practice at Nathan Dumm & Mayer P.C. involves a broad range of litigation matters, including the defense of workers’ compensation claims, insurance claims, personal injury claims, and premises liability claims.